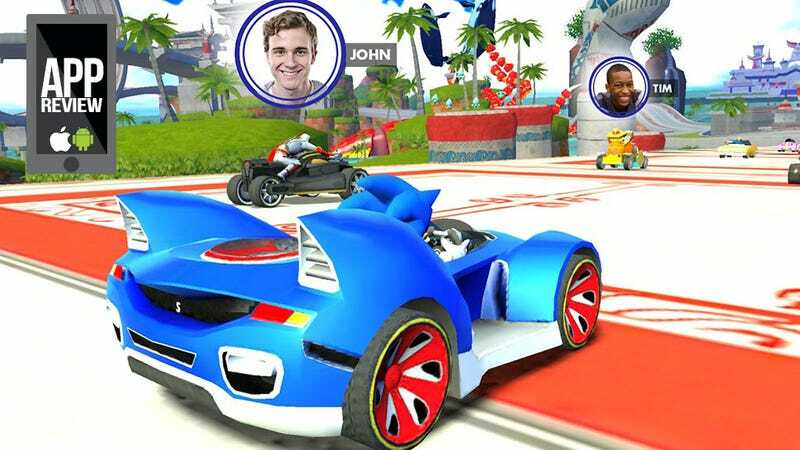 Sonic & All-Stars Racing Transformed Goes Mobile. Is That Good? Sonic & All-Stars Racing Transformed is available today on iOS and Android, giving mobile gamers a chance to race on land, sea and air as iconic Sega characters like Sonic, Amigo, John and Tim. Is it worth $4.99? Mostly. I am a big fan of the console/PC version of Sonic & All-Stars Racing Transformed, so I went into the mobile version with high hopes. Some of them were met. Some were not. Pretty-ish — The visuals might not be as sharp and vibrant as the console versions, but they'll do. Controller Support — Of course Android, but also the new iOS-certified controllers. Using a gamepad is the only way to avoid dealing with the automatic acceleration that's mandatory for touch screen play. Online Play — No one is playing yet, but it's nice to have the option, right? In-App Purchases — For $4.99 Sonic & All-Stars Racing Transformed only gives players free unlimited access to races on easy difficulty. Anything more has to be paid for via rings or stars. In the in-game store, along with some very expensive early character unlocks, there's the option to spend $9.99 to unlock all difficulties forever and ever. It's good that the option is there. It would be even better if it was mentioned before players dropped $4.99 on the game. Maybe just give us the option to play $14.99 up front. Controller Support — Controller support while racing is a good thing. Not having controller support in the menus iOS verion) is a bad thing. Auto Accelerate — As I mentioned previously, all touch screen or tilt control options auto accelerate. There is no option to change that. Unfortunate. Sonic & All-Stars Racing Transformed is a lovely port that takes a few wrong turns on the way to the app stores. Nothing that can't be tweaked and patched, and nothing so annoying that a real fan of kart racing shouldn't give it a go.